Organizing jewelry can be an inspiring experience, especially if you are a jewelry collector. 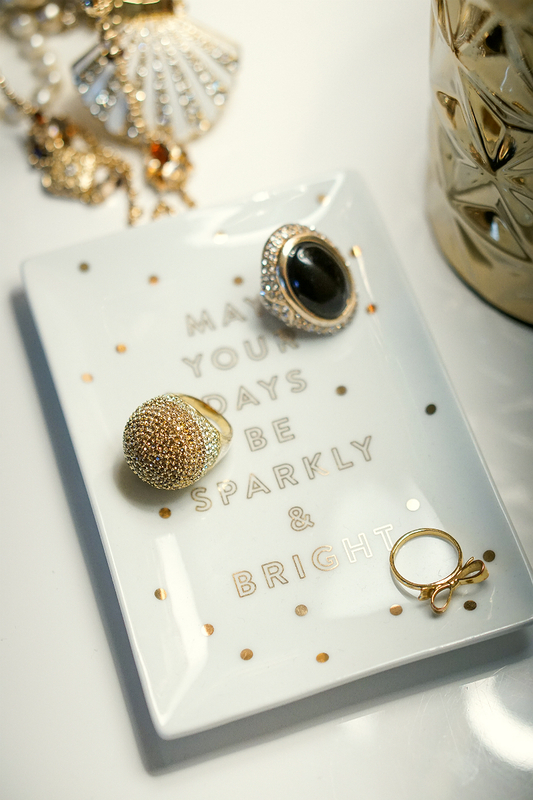 These little baubles are designed to bring us joy, make us sparkle, and add a dose of glamour to our everyday lives. That’s why organizing jewelry is an essential part of tidying up, whether you’re a fashionista or not. To motivate you to get organized this year, Inspirations & Celebrations recently launched a new home organization how-to series called “The Joyful Guide to Home Organizing”. Over the next several weeks, learn tips on how to organize your home. The first part of the series taught you how to organize clothing and accessories. 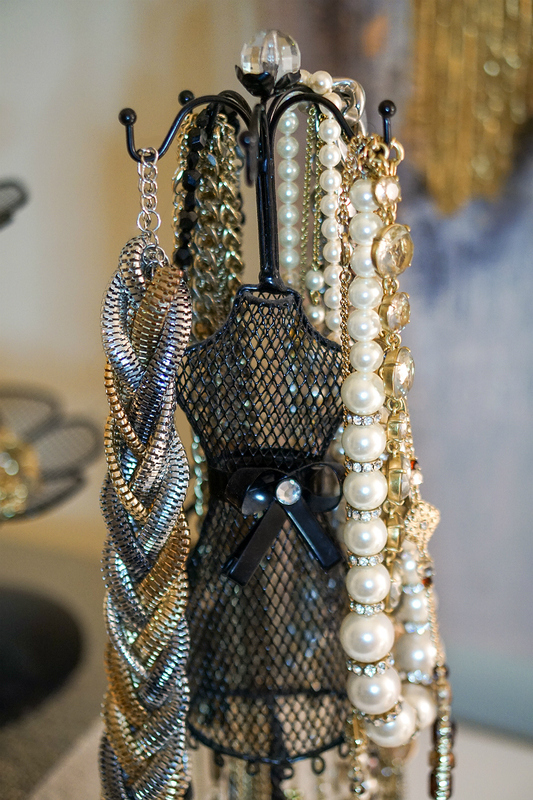 In today’s edition, discover pretty ways to organize jewelry. 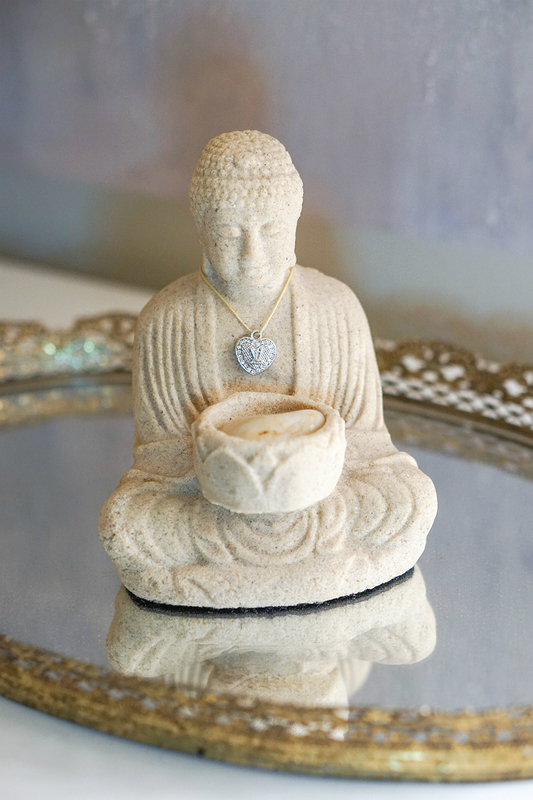 To put you in a good mood, an inspiring jewelry or trinket tray (with a positive message inscribed on it) is a great place to start. Whether you use it to hold your wedding ring or your go-to everyday rings, the tray add an element of beauty to any vanity or dresser. Plus, they make it easy for you to put on and take off your jewelry in a dash. Since necklaces can often get tangled and messy (when stored away in a drawer or jewelry box), another pretty way to organize jewelry is with a necklace stand. From understated, modern designs (like the contemporary t-shape jewelry tree) to ornate, vintage-inspired necklace stands (like the one above), these are not only practical, they’re also really pretty. Plus, they keep your necklaces neatly organized, the way all beautiful jewelry should be stored. Whether it’s an antique locket from your grandmother or a delicate charm that holds extra meaning for you, hanging jewelry on unexpected accessories (like a bust or statue) is always a pretty way to organize jewelry. Not only does it act as a piece of decór, but it also highlights the special piece. 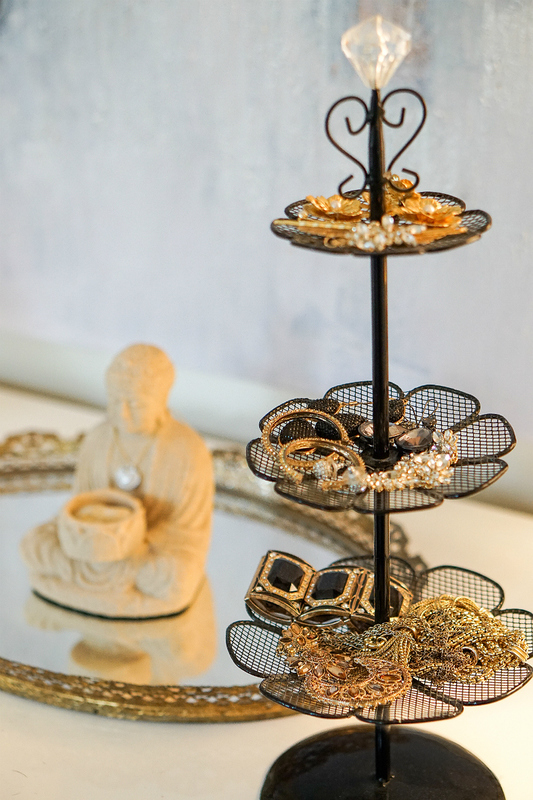 To help you conserve on space, opting for a tiered stand is a smart way to organize jewelry. 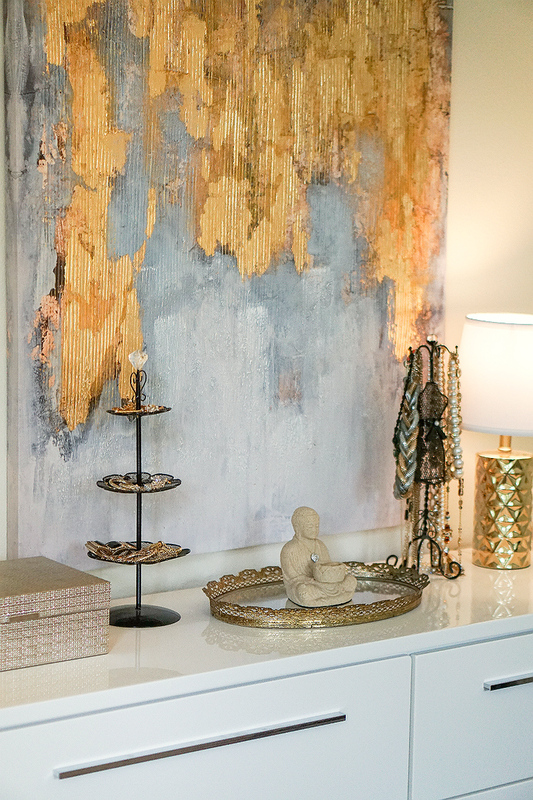 A decorative stand (like the one above) adds an ornamental accent while keeping jewelry neat and tidy. 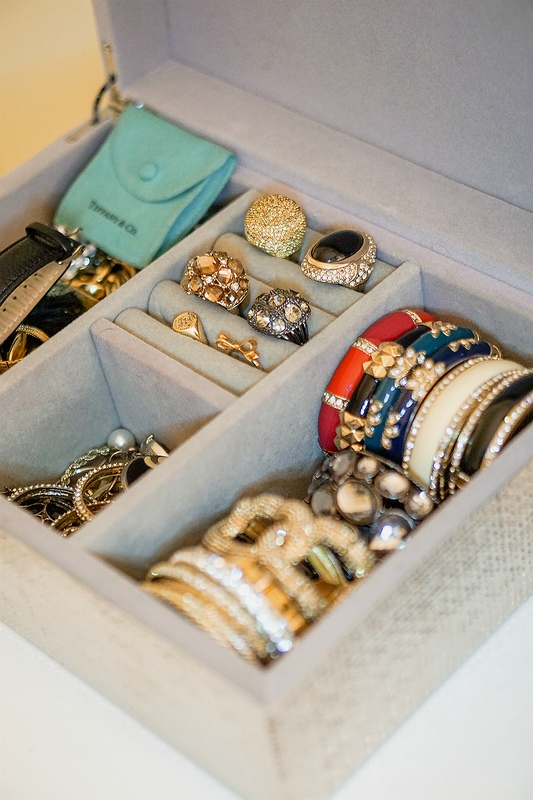 Plus, it’s a great option for organizing jewelry you wear often. To store valuables and fine jewelry, a jewelry box is a wise choice. These often come with built-in storage to help you organize my type – earrings, rings, bracelets, etc. Jewelry boxes are also helpful in protecting and keeping your valuables safe, especially if they’re expensive. When shopping for a jewelry box, look for quality craftsmanship and preferably one with a lined interior. For more inspiring tips on tidying up, check out the Home Organization section on Inspirations & Celebrations.